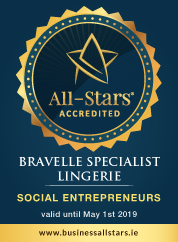 Bravelle - Post-mastectomy Bras, Post-mastectomy Swimwear. Pauline is a breast cancer survivor, and is all too familiar with the difficulties faced in finding comfortable, supportive and stylish post-mastectomy bras and swimwear. Following her own surgery, her search for the garments she required proved frustrating and ineffectual. With post-mastectomy products near-impossible to find in Ireland, she decided it was time to bring them here herself. Today Bravelle is run by Pauline and her daughter Kate, who are both fully trained as professional prosthesis fitters. Pauline is dedicated to assisting customers in recovering their femininity after breast cancer surgery, and finds it truly rewarding to see women leave Bravelle with a renewed sense of confidence.